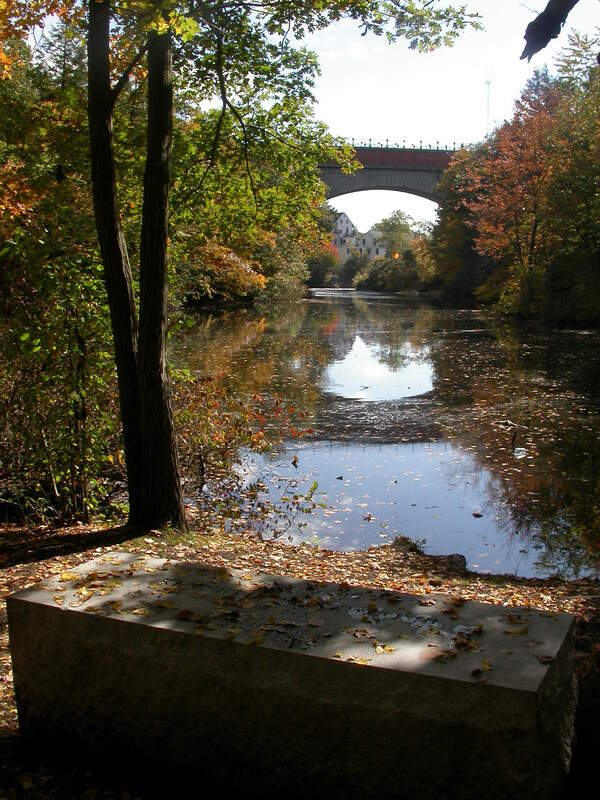 I recently (Oct, 2005) made a trip to the Boston area to find my mother's birthplace. 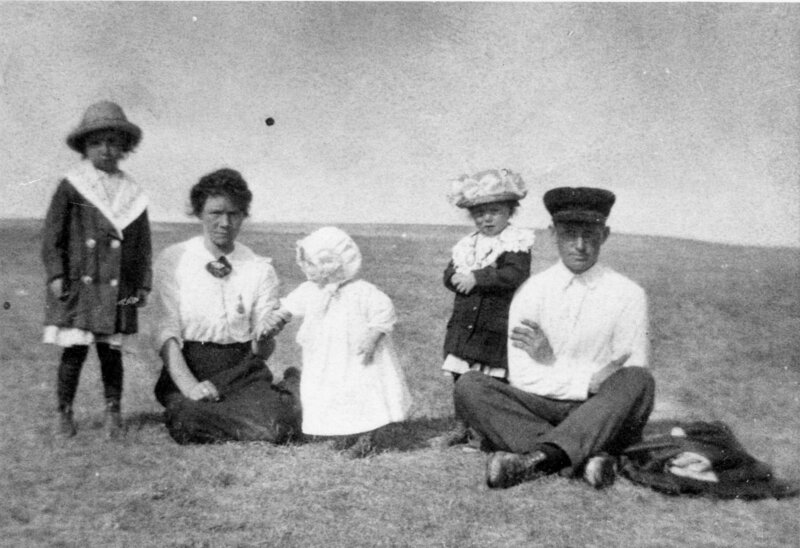 I'm not absolutely sure I actually found it, but I did get to walk in my grandparent's, Paul and Matilda Wilzer, footsteps. 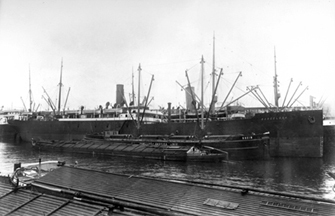 My grandfather Paul Wilzer arrived at Ellis Island, New York on Sept 2, 1906 on the ship Barcelona. 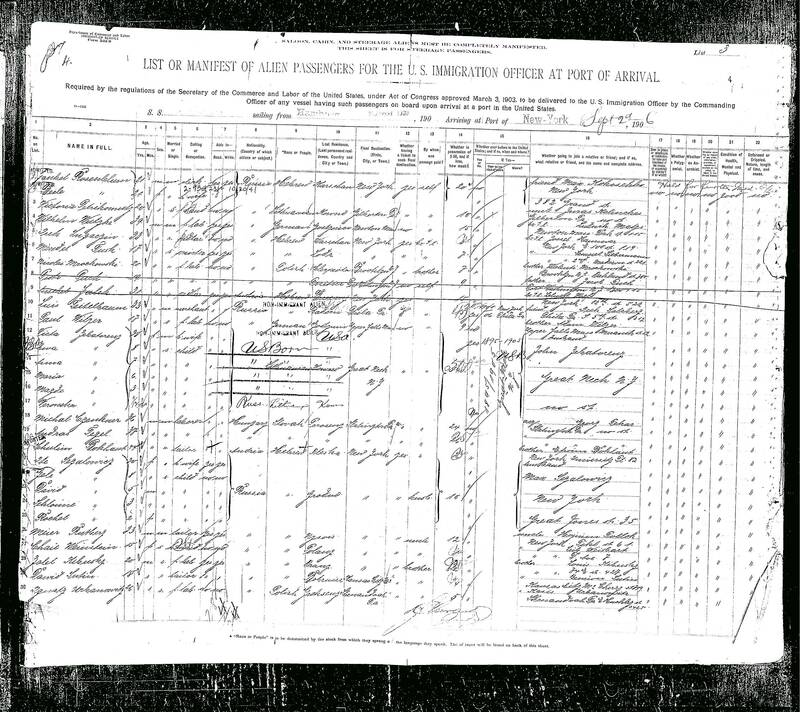 The ship's manifest lists his final destination as Upper Falls, Mass living with brother Ewald Wilzer. My copy of Paul and Matilda's marriage certificate (Feb 6, 1910) lists their residence as Newton, Mass and both their occupations as 'In Silk Mill'. 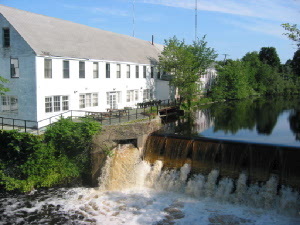 My mom, Ida, had always said she was born in Newton Upper Falls but all I could find on any map was Newton. My copy of her birth certificate (Feb, 11, 1912) says '369 Elliot St, Newton, Mass'. This is also given as her mother's address on the certificate. It gives Paul's occupation as 'Silk Dresser'. Mom's older sister Wanda was born in 1910 in Boston, but it was probably Newton. The third sister Frieda was born in Newton, MA in 1914. Google Maps shows that the address 369 Elliot St, Newton, MA still exists. Armed with this information, Kathryn and I decided to try and find the house where mom was born. We had stayed in Marblehead, Mass the first night. After a quick visit to the nearby Salem Witch Museum, we set out to find 369 Elliot St. This was a bit of a chore as Newton is now a fairly large city (2000 population of 84, 000). As we were making our way along Center St to Elliot St, we noticed that several of the homes were very new. However, as we turned onto Elliot St, it was obvious that most of the houses were very old and we started to get excited. We were anxiously checking house numbers as we hit the 300's. When we hit 355 Elliot, there was a stop light at Chestnut St. As we went through the intersection, we saw 366 and 368 on the left side of Elliot but to our dismay, on the right side was a cluster of white buildings and a sign that said "Echo Bridge Mall". On the other side of these buildings was a bridge over the Charles River and the numbers became 400's. My heart sank - someone had torn down 369 and built a mall I thought. Turning around we went back into the parking lot of the Mall. Although the offices had numbers in the 370's and 380's, we noticed that one of the offices between them had 369 on the window (see photo 1 at left). We entered this small office to ask if they know when the Mall had been built. No one knew but Kathryn looked at the walls and said "The windows are new and these walls are white, but if you look close, you can see that they are just old painted brick." 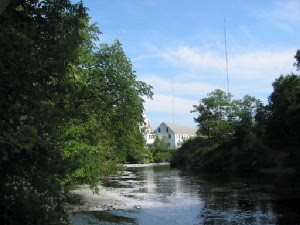 My breathing quickened as we went outside and walked along the river side of the building (photo 2). You could definitely see that it was an old building. A 'No Trespassing" sign stopped us from going very far but I was getting excited. We went back out front to another small store to see if there was a bookstore nearby that might give us more information. 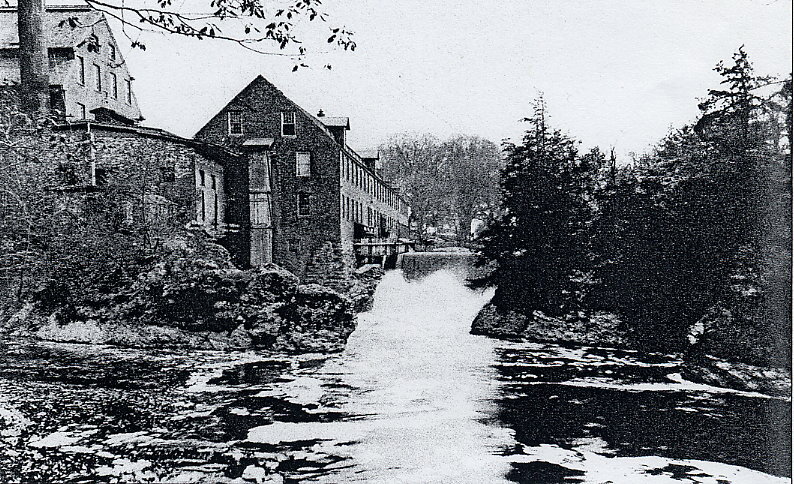 When I explained to the lady in the store that my grandparents had came to the area almost 100 years ago and had worked in the silk industry, she said "Oh, you mean the mill." She said the mall had originally been a sawmill and had then become a silk factory. We had found it! 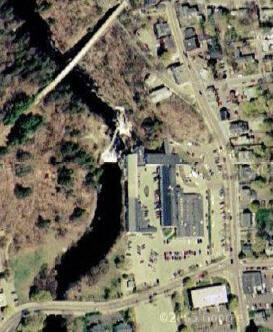 We also solved the mystery of Mom's Newton Upper Falls when we discovered the sign (Photo 3) that showed that Upper Falls is one of 14 villages that make up Newton. We hurried back outside. 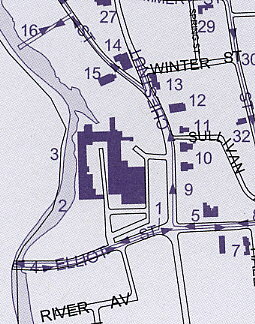 The 'Mall' is basically an inverted "U" shape (dark part of photo at right) with one-story buildings at the front and two and three-story ones at the back and sides. It consisted of several small offices. We went around the entire building, taking pictures, searching for information and access to the back and river-side of the building. Almost all of the offices had security locks and intercoms and either no one answered or they didn't have any info. One young lady was leaving an office and we asked her for info. She couldn't help us as she had just started working there but she suggested we could see the back of the building from the bridge. This turned out to be the Echo Bridge (16 on the map and photo 4) where we got some great photos. We went back to the river-side of the building and under the No Trespassing sign. I knocked on a window and got the attention of someone inside. By shouting through the window, we finally got permission to make our way to the back which had a nice deck which was formerly part of a restaurant and we got some more good photos. We then found our way to the Newton History Museum at the Jackson Homestead. 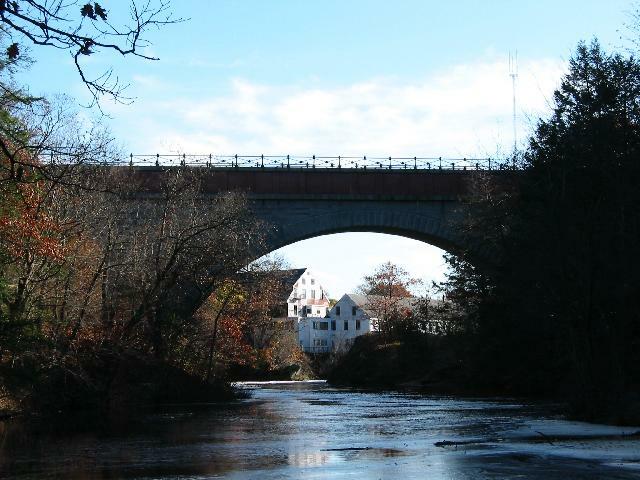 A nice lady there gave me a great pamphlet entitled "Discover Historic Newton Upper Falls", as well as photocopies of the Massachusetts Historical Commission report on the site and photos from a Newton history book. 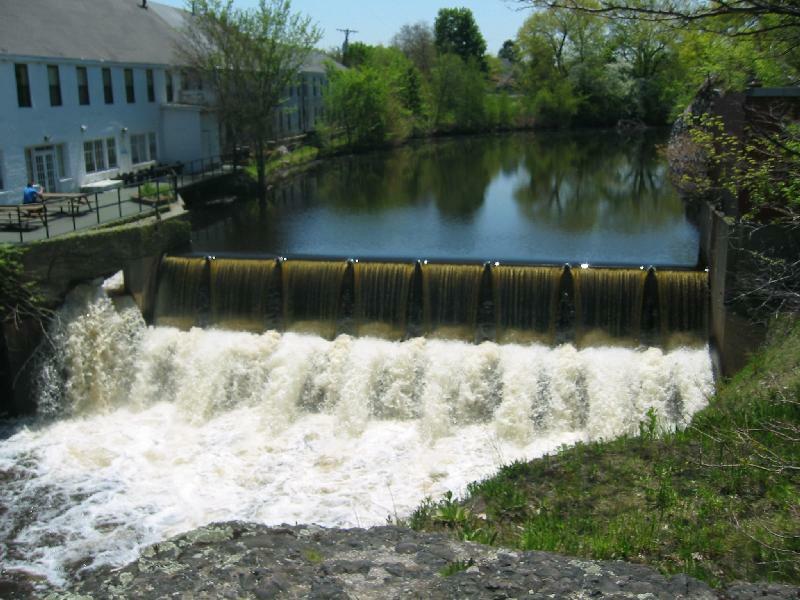 There is a fair amount of history of Upper Falls so I have created two separate pages called Newton Upper Falls and History of the Mill to present this information. Click on the link to go to these pages. 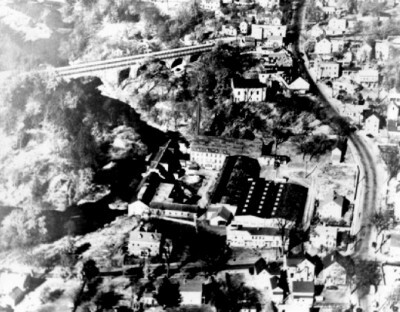 A local Newton historian, Kenneth W. Newcomb, has written an online book called "The Makers of the Mold: A History of Newton Upper Falls, Massachusetts". It contains tons of history. 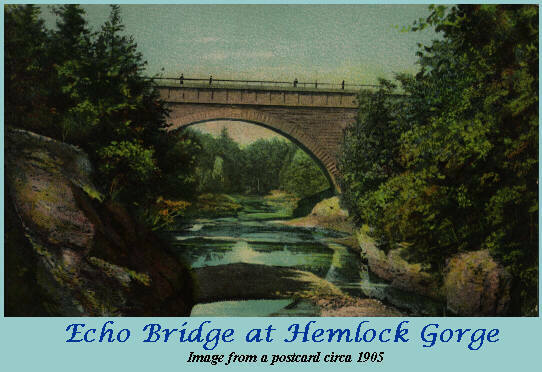 You can read it online at http://www.hemlockgorge.org/MakersTitlePage.htm. So, did I find my Mom's birthplace? I'm not absolutely positive but the buildings on either side of the U-shape close to the front are one-story and look like they could have been workers' housing. 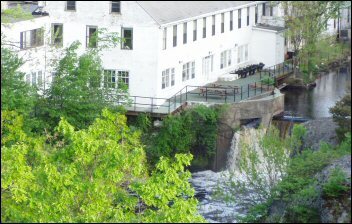 Also the Discover Historic Newton Upper Falls pamphlet says that many of the earlier factory buildings were made into 'workmen's housing'. I do know that I found the place were Paul and Matilda both worked when they first came to North America and I may have walked in their footsteps. What a wonderful feeling!